Koichi Kamoshida/Getty ImagesSnow monkeys enjoy a soak to take the stress off. 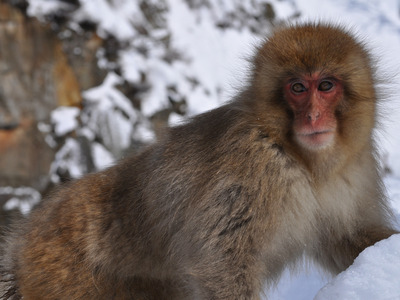 Japanese snow monkeys have been observed since the 1960s to take advantage of hot springs in Japan when the temperatures drop. In humans, we know that a hot bath can reduce the levels of stress hormones, so a team of researchers thought the same might be true for the macaques. 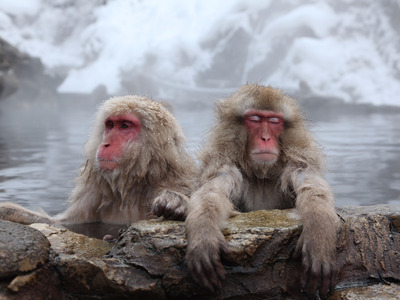 It turns out that when the snow monkeys are making the most use of the baths because it’s cold outside, they too experience a de-stressing effect. For many people, the best way to melt off stress after a hard day is to soak in a hot bath. The Japanese macaques – commonly referred to as “snow monkeys” – that draw tourists to Jigokudani Monkey Park feel the same way. And as a relaxation or de-stressing technique, a hot bath really works, according to a study of the monkeys newly published in the journal Primates. The macaques use the springs to warm up in winter, according to the researchers behind the study. And when they bathe, their stress hormone levels drop. To figure this out, Rafaela Takeshita and colleagues from Kyoto University picked a troop with 12 adult female macaques. The monkeys are the non-human primates who live the furthest north in the entire world. They do grow longer and thicker fur in the winter, but at least some also indulge in baths at hot springs in the park. The first time researchers spotted this behaviour was in 1963, when a young female was spotted in a spring at a hotel. Observations revealed that other monkeys did the same, though they stopped bathing as the weather warmed up by the end of March, indicating they primarily did this to stay warm. The park decided it’d be more hygienic for the monkeys to have their own hot spring than to share one with humans, so they built one just for the macaques. By 2003, they’d observed that 31% of females regularly made use of the hot water. But cold isn’t just uncomfortable. Humans release stress hormones when exposed to cold temperatures; monkeys do the same. Since hot baths have have been shown to help lower stress hormone levels in humans, Takeshita and co-authors thought the same might be the case for the macaques. The scientists tracked the monkeys throughout a winter and spring, regularly collecting their faeces to measure hormone levels. But during the times that the macaques would bathe, especially in winter and when it got cold outside, stress hormone levels would drop. Next time you’re feeling stressed, take a cue from a macaque and try a hot soak.